It feels like it has taken forever for the new 2009 Quantum PT reels to finally start popping up for sale. Many of the latest 2009 reel offerings from top tier manufacturers were available almost right after ICAST, and in the case of Abu Garcia’s Revo SKT and Winch, even before ICAST. None the less, at a time of year when many anglers across the country are packing their fishing gear away and hunkering down for the winter I feel fortunate to be have the opportunity to take this reel for a much anticipated test drive. 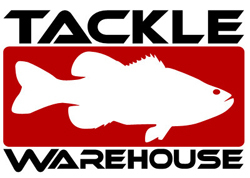 The lightweight of this generation of PT baitcasters can be attributed to a number of design changes. Including the overall frame size, spool shape, simplification of components, and smaller handle. The new Quantum Energy PT has a much smaller frame and lower overall stance when mounted on a rod. This ergonomic change should translate to a more enjoyable and less tiring day out on the water. This modified spool for the new “Burner” reels allows better line flow. Furthermore, its smaller allows you to use less line when all you want to use the reel for is for flipping and pitching. (4) The Micro ACS brake system has 4 settings vs. the Infinite ACS’s 10. 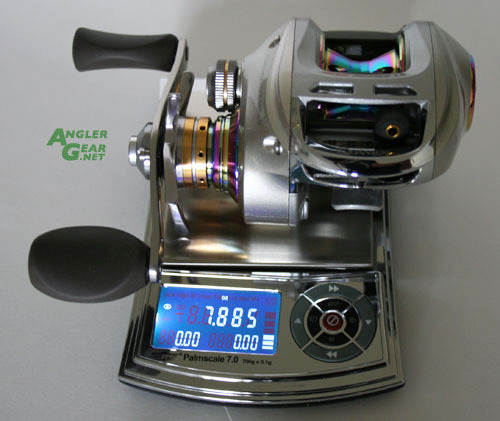 Unlike the previous generations 10 brake settings (0 breaks on to 9 on) this reel follows the path of the older ACS systems with each click turning on a set number of brakes. In this case it is 0, 3, 6 and 9. Taking a quick measurement, the new 2009 Energy PT handle comes in at 80mm vs. the previous generations 85mm. A small difference, yet it is still noticeable in hand. The same paddle style grips are used as on the previous generation and will accommodate the use of “reel grips” nicely. The inward swept handle and drag star design of course is a trend set by the Daiwa Steez and Zillion series reels. (6) The use of the multicolored titanium deposition finish has been relegated to highlight duty instead of covering majority of the reel. I like the more subdued look of this reel compared to the previous generation. 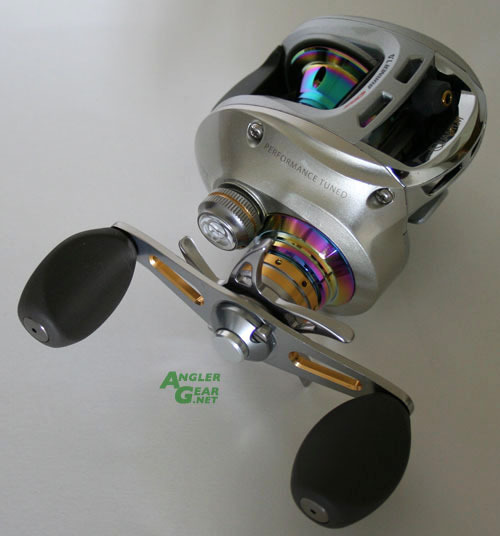 The subtle use of the titanium deposition finish definitively gives this reel a “modern” look. (7) There is a new lubrication port on the handle side interior. This Port allows quick and easy access for adding lubricant in the future. Thus far this baitcase reel feels good in hand and looks good on paper, but I won’t be satisfied untill I give it a good test out on the water. On the water opinions to come. The 2009 Energy PT has a multi-coated finish that is reminiscent of the coating found on the Accurist PT. Weighs in at almost 7.9 oz, about .3 oz heavier than the new Curado 200E7 without line attached. 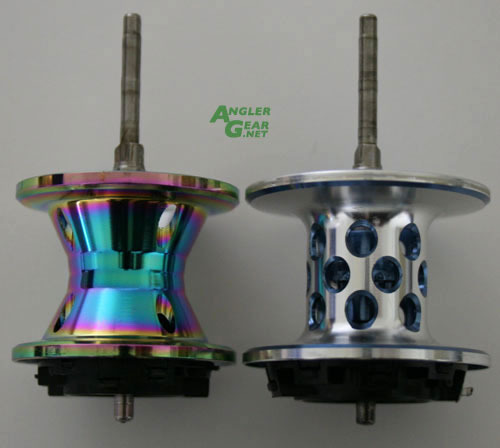 The new Energy PT “V” Spool found on “Burner” reels compared to the older deep spool design. The previous generations stance on a Superlite PT rod. The 2009 Energy PT has a lower stance than the previous generation on top of a Quantum Superlite PT rod. Overhead view of a 2009 Quantum E100HPT atop a Quantum Superlite PT rod. Looking for a 2009 Quantum Energy PT?